Nestled amidst carefully tended gardens in the shadow of the walls of Jerusalem's Old City lies Mishkenot Sha'ananim, a neighborhood dating to the late 1850's which has come into a new lease of life and is now an integral part of the city's cultural and artistic infrastructure. By 1860, a long, low building stood amidst the desolation which surrounded the Old City, on the barren and rocky slopes facing Mount Zion, kept company only by a windmill erected three years earlier above the Valley of Hinnom. With its crenellated façade, somewhat reminiscent of that of the Old City walls themselves, the building gave the appearance of a fortress, as if to suggest that it was capable of defending its inhabitants, like the wall opposite. A covered balcony running the length of the building, supported by iron pillars and decorated by wrought iron arches, blending harmoniously with the grillwork of the doors and windows, added a touch of grace to the building without marring its austere simplicity. Some 15,000 Jews, Moslems and Christians were crowded together within the walls of Jerusalem by the mid-19th century. Seeking refuge from marauders, they lived in tiny and dilapidated houses, built around narrow courtyards. The twisted streets were invariably strewn with garbage and the carcasses of animals who died in the frequent droughts. Poverty was the all-pervasive way of life. Yet, despite the poverty, filth and overcrowding, Jerusalem remained the Holy City - the site of the Temple Mount for the Jews, the Dome of the Rock for the Moslems and the Church of the Holy Sepulchre for the Christians. Thus, it was not a simple decision to move outside the city walls. Beyond the shelter given by the safety of the walls and the gates which were closed each evening at sunset and opened again only at sunrise, lay roving bands of Beduin marauders and thieves, to say nothing of wild animals. Moreover, those who left the Old City cut themselves off from the city's communal institutions, synagogues, schools and shops. But once the intitial step was taken, Mishkenot served as an example for the establishment of additional Jewish neighbourhoods beyond the Old City. Even so, Mishkenot remained isolated for more than three decades. Other new suburbs were built further to the west and northwest and only in 1892 was the neighbourhood of Yemin Moshe founded adjacent to Mishkenot. The noted British philanthropist, Sir Moses Montefiore, and Judah Touro and Gershom Kursheedt of America were the three 19th century Jewish leaders who laid the foundations for the New Jerusalem. Montefiore, the son of a Sephardic family who had moved from Italy to Britain, visited Jerusalem for the first time in 1827. Three years earlier, he had retired from his successful financial career and decided to dedicate his resources to aiding his fellow Jews. Over the next half century, until his death at the age of 101 in 1885, Sir Moses championed the cause of rights for Jews throughout the world. He fought discrimination against Jews in his home country, intervened with the Sultan of the Ottoman Empire after the notorious Damascus Blood Libel in 1849, met with two Czars to alleviate the condition of the Jews in Russia, discussed the plight of Jews in North Africa with the Sultan of Morocco, and was granted an interview with the Shah of Persia. Montefiore's philanthropy was evident wherever there was a Jewish community. His gifts and donations reached individuals and communities, synagogues and institutions, Christian as well as Jewish. Despite the hardships of overseas travel and travel within Palestine at that time (before the paving of the road from Jaffa to Jerusalem in 1869, the journey from the port to the Holy City took 16 hours), Sir Moses made seven pilgrimages to Eretz-Israel during his lifetime. The Jewish poor of the Holy Land was his favourite cause. He responded to every call based on hunger, earthquake, plunder or pestilence, as well as to the general needs of individuals and institutions because of their overriding poverty. He was not, however, alone in his concern with the plight of the yishuv (the pre-state Jewish community of Palestine). The Jews of the United States of America, despite the fact that they were a young community facing their own problems of economic and cultural absorption, were quick to give practical expression to their religious and humanitarian bonds with their brethren in Eretz-Israel. In order to avoid frequent costly and dangerous voyages to the Holy Land, the Jewish community of New York decided in 1834 to establish a special fund, known as the hevrat trumat hakodesh, to centralize the collection and transfer of monies overseas. The initiator of the fund was Israel Bar Kursheedt, a leader of US Jewry and chairman of the American-Jewish action committee over the Damascus Affair. Kursheedt's son Gershom was born in Richmond, Virginia in 1817. He moved to New Orleans some 20 years later and became a prominant member of the local business community. Gershom's public and philanthropic activities were numerous and varied. He was a freemason and a member of the New Orleans City Council and of the Academy of Sciences and was active in the Whig Party. During an epidemic of yellow fever in the South, he played a prominent role in the relief operations. But Kursheedt's main concern was for the Jewish community. He initiated numerous New Orleans Jewish institutions, both secular and religious. He also served as adviser on Jewish affairs to the wealthy New Orleans businessman, Judah Touro. The son of a cantor, Touro was born in Newport, Rhode Island, and moved to New Orleans in 1801 from Boston. He amassed a fortune as a commission merchant with investments in steamships and real estate. During the war of 1812, Touro volunteered to fight in Andrew Jackson's army and was severely wounded in the Battle of New Orleans. Unlike other rich southerners of those days, he lived a modest and simple life. Touro was opposed to slavery and helped free a number of slaves, assisting them in setting up their own businesses. Touro was also a philanthropist who contributed generously to a variety of causes in Boston and New Orleans including $10,000 to the Bunker Hill Monument in Boston, $40,000 to the Touro Hospital he founded in New Orleans, and many thousands of dollars to a variety of Christian churches. However, Touro's connection with the Jewish community and Jewish causes was limited to a modest contribution to the first congregation in New Orleans. It was only some nine years before his death in 1854 that Touro finally took an interest in Jewish affairs and helped build a new synagogue organized by Gershom Kursheedt, which he attended regularly for the rest of his life. "It being my earnest wish to cooperate with the said Sir Moses Montefiore of London, Great Britain, in endeavouring to ameliorate the condition of our unfortunate Jewish brethren in the Holy Land, and to secure them the inestimable privilege of worshipping the Almighty according to our religion, without molestation, I therefore give and bequeath the sum of Fifty Thousand Dollars to be paid by my Executors for said object through the said Sir Moses Montefiore, in such manner as he may advise as best calculated to promote the aforesaid objects..."
Kursheedt helped compose the list of beneficiaries and was appointed a trustee of the Touro estate. This position gave him a historic opportunity to be the first American Jew to play a substantial role in the strengthening of the yishuv in Palestine. The dire straits in which the yishuv found itself during the Crimean War (1854-1856) was intensified by a ban by Czar Nicholas I on Russian Jewry sending charity to the Holy Land. This led Montefiore to seek increased aid from the American Jewish community. It was in this context that he accepted the responsibility for utilizing the Touro Bequest for some worthy project. Thus, in 1855 and 1857, Kursheedt accompanied Montefiore on his trips to the Holy Land to ascertain the specific form the project should take. Sir Moses, his wife Judith, Kursheedt and others left England on April 2, 1855. They travelled through Paris, Vienna, Trieste and Constantinople. In the capital of the Ottoman Empire, Montefiore was awarded the Order of Medjidjeh by the Sultan. More important, with the aid of Britain's ambassador to the Sublime Porte, he succeeded in obtaining from the Sultan a firman (decree) permitting him to purchase land near Jerusalem. When the visitors reached Jerusalem on July 18, many of the city's residents met them at Abu Ghosh, a village some three hours walk from the city walls, and led them in a ceremonial procession into the Holy City. After some study, Sir Moses and Kursheedt decided that the best use to which Touro's money could be put would be the erection of a hospital which would serve the Jewish residents of Jerusalem. Thus, Sir Moses sought land within the walls. He found a plot, but decided that it was not suitable because it was too close to a slaughterhouse and would be a source of contagious diseases. "You are my friend, my brother, the apple of my eye. Take possession of it at once. This land I hold as an heirloom from my ancestors. I would not sell it to anyone for thousands of pounds, but to you I give it without any money; it is yours, take possession of it. I myself, my wife and children, we are all yours." "By the permission of the Sublime Porte and the Imperial Throne, may the Lord of Creation preserve them, and in conformity with the letters on that subject from the Grand Vizier to Sir Moses Montefiore (Baronet), the pride of the people of Moses, the man of Prudence, etc., etc., the son of Joseph Eliyahu etc., etc, Sir Moses purchases a piece of land for the purpose of establishing on it a hospital for the poor of the Israelites who reside in Jerusalem, and to do with it as he pleases." A few days later, on August 15th, the inhabitants of Jerusalem joined Montefiore, Kursheedt and the rest of the party in laying the cornerstone of the new building. Sir Moses placed a copy of the deed under the cornerstone and Kursheedt added Touro's ring. The party pitched their tents on the plot and Sir Moses had a fence built around it, to mark the property, which he called "The Vineyard of Moses and Judith." In addition, Sir Moses ordered the building of two dwellings on the property, for his use when visiting Jerusalem, stipulating that the builders be Jewish. Upon returning home, Montefiore decided not only to provide a livelihood for the residents of his newly-acquired land, but also, at the same time, to help the poor by reducing the price of flour. He therefore sent a British expert from a firm of millwrights in Canterbury with the necessary equipment and instructions to construct a windmill. The windmill was duly built, but it broke down after a few years and the establishment of other flour mills operated by steam made the Montefiore windmill uneconomical. And so, it stood unused, a Jerusalem landmark. Bethlehem. The red tiles for the roof were imported from Marseilles and the roof was thus nicknamed the "Tarbush" by the residents. The ornate iron arches and grilles were ordered from Montefiore's home town of Ramsgate and to this day, on the pillars supporting the roof of the balcony, the inscription, "G.S. Culver, East Kent Metalworks, Ramsgate, England" can be seen. The total cost of the building was 6,000 pounds sterling, a substantial sum for that time. This sum, local residents argued,was some 50 times greater than it should have been, because the architect designed the building without taking the topography into consideration, so that bedrock had to be cut away to fit the building into the slope, and a well had to be dug for the inhabitants. Architectural problems were not the only ones that the builders faced. Landlords in the Old City, as well as fanatic Moslem groups, opposed the establishment of new living quarters outside the city walls. Together they succeeded in halting construction by invoking a Turkish law which, for military reasons, forbade building near the walls. Sir Moses had to approach the Sultan for another special permit, which was granted in 1859. The next year Kursheedt made his third visit to the Holy Land, this time by himself, to supervise the final stages of construction and the allocation of the accomodations. Despite the difficulties, the building was finally completed. There were 16 apartments, each with two rooms and a kitchen. There were two synagogues, one each for the Ashkenazim and the Sephardim, a mikve (ritual bath), a well with a small hand-pump from England - a modern marvel that people came specially to see - individual garden plots for each resident, and the windmill. The building was dedicated early in 1861. Rabbi Joseph Nissim Burla, president of the Beth Din (Rabbinical Court), delivered a sermon praising the efforts of Montefiore and Kursheedt. Five years later, during his sixth visit to Eretz-Israel, Montefiore, after consulting the leaders of the Jewish community, decided to add an additional house, containing another four apartments. The cornerstone was ceremoniously laid while Sir Moses was still in Jerusalem but three years passed before Rabbi Isaac Rosenthal was appointed to supervise construction. Although the new buiding was completed in a year, it was another five years before the tenants finally moved in, during Montefiore's seventh and last trip to Palestine in 1875. In the centre of the building, on the top of the stone façade, the following words were inscribed: "Mishkenot Sha'ananim was established with the money bequeathed by the benefactor Judah Touro, may his soul rejoice in Eden, in the holy community of New Orleans, may God protect it, in America, by Sir Moses Montefiore, in the year 5620 of the Creation." In the founding charter of Mishkenot the inhabitants are enjoined to recite prayers in memory of Touro daily and on the anniversary of his death. Yet, despite the inscription and the charter, Mishkenot was often still called by its original name, Kerem Moshe - "The Vineyard of Moses." Many Americans were disturbed by the fact that Montefiore seemed to have received the sole credit for establishing the new neighbourhood and that the roles of Touro and Kursheedt were forgotten. Moreover, the philanthropists in America and England, who felt themselves responsible for the project, were disappointed when the residents did not achieve economic independence within the expected time and failed to establish a new way of life outside the walls of the Old City and they did not hesitate to voice their concern. Mishkenot Sha'ananim derives its name from Isaiah 32:18: "My people will abide in peaceful habitation, in secure dwellings and in quiet resting places." But that prophecy was not immediately fulfilled. The difficulties in enticing the residents of Jerusalem to leave the safety of the city walls have already been noted. These were overcome to some extent, by special allocations provided by Sir Moses to those families willing to live in Mishkenot. Nevertheless, in the early years, many residents lived in the new settlement during the day and returned to the Old City at night. The problem of safety was very real. During the first few years, one resident was murdered on his way from the Old City and another was killed trying to chase away marauders. Soon, however, the opposite problem arose. Because Montefiore was interested in alleviating the poverty rampant throughout Jerusalem, he wanted all of the city's poor to benefit from the improved conditions at Mishkenot, not just a small number of families. Thus the Mishkenot regulations specifically stated that residence in the new homes would be limited in time and that the apartments should change hands every so often. But the original residents refused to move out and Montefiore, impressed by their pioneering spirit, was not prepared to evict them. Montefiore's heirs, however, considered imposing rent collection in order to avoid permanent squatters' rights. The move, however, was unsuccessful and as late as 1948, several of the residents were still the descendants of the original inhabitants. The isolation of Mishkenot was also a mixed blessing. Every night the gates of the Old City were closed, as were the gates of the new settlement. 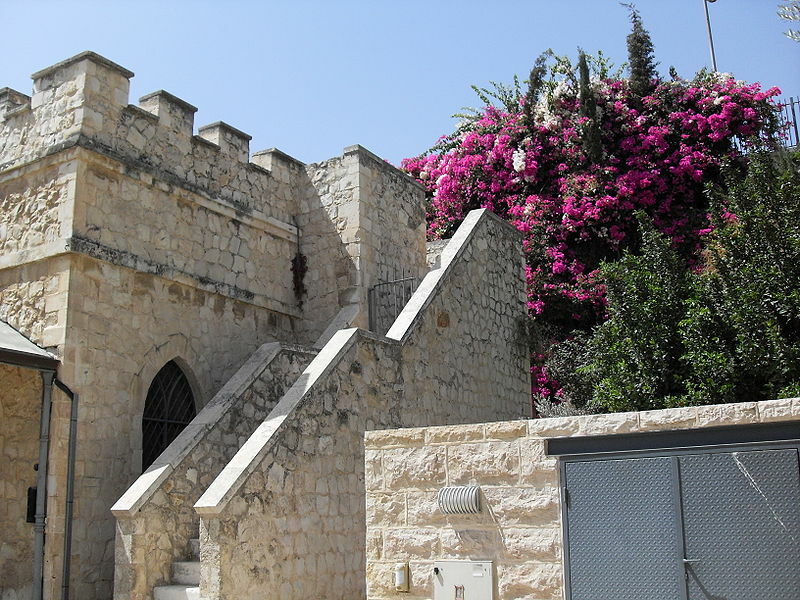 It was only in 1875, 15 years after Mishkenot was founded, that a small opening was made in the city walls to permit sick people to be brought to the hospital in the Old City at night. Only in 1898 were the city gates kept open both day and night. While the isolation made life difficult for the settlers, it also forged a spirit of solidarity which allowed the residents to overcome hardships and create an integrated neighbourhood from members of the different communities. During World War I, the economic assistance upon which most of the families of that time depended - the haluka or charitable contributions from abroad - was stopped. Hunger and disease prevailed, not only in Jerusalem but throughout the country. The defeat of the Ottoman Empire only embittered it further against the Jews. Thousands were banished or fled; others had to pay a ransom to avoid being drafted into the Turkish army, and typhoid took its toll among the remnant of the community. Property and essential foodstuffs were often confiscated by the authorities and nature, too, seemed intent upon trying the enfeebled population with a plague of locusts which invaded the country. During the battle for Jerusalem in 1917, many of the residents of Mishkenot sought shelter in the Old City where they felt safer behind the walls and were, in fact, saved because the British avoided bombarding the Holy City. Throughout the country, the diminished yishuv welcomed the British as saviours. The Balfour Declaration, issued on November 2, 1917, and the ensuing British Mandate gave the Jews of Palestine renewed hope and the belief that they could rebuild their homeland in peace. But the hope was short-lived. Only two years after the war had ended, an enraged mob, incited by Haj Amin al-Husseini, later appointed Grand Mufti of Jerusalem, attacked the Jews of Jerusalem — the riot of April 1920 was a foretaste of the coming struggle. In response to the attack, Zev Jabotinsky, then Jerusalem commander of the Haganah, the clandestine Jewish defense organization, organized the residents of the Old City and the new quarters outside the walls for self-defense. Jabotinsky was arrested by the British authorities shortly thereafter and expelled from the country. But his work bore fruit. It served as a deterrent to rioters and gave the residents of the exposed neighbourhoods a much-needed feeling of security. As a result, the population of the area was spared the fate of their brethren in Hebron and Safed when 133 Jews were massacred by Arabs and 339 wounded in August 1929. Again and again the outlying quarters of Jerusalem were attacked by well-armed Arab bands, only to be saved by a handful of Haganah members who risked their lives with a few pistols and grenades. But such tactics would have been unsuccessful without the active participation of the residents, who were willing to inhabit the exposed neighbourhoods, to stand guard duty, to supply food to the Haganah defenders and to hide their arms from the British, who searched the area thoroughly after each attack. At the beginning of the fighting which broke out following the United Nations vote on the partition of Palestine on November 29, 1947, the British ordered the evacuation of both Mishkenot Sha'ananim and the adjoining suburb of Yemin Moshe. The two lone quarters were of particular importance to the Arabs because they stood on the road to Hebron and their location near the Old City walls allowed them to serve as a link to the besieged Jewish quarter in the Old City. But they were also dangerously isolated. Situated about a kilometre from the nearest Jewish neighbourhoods, to the north and northwest, Mishkenot and Yemin Moshe were separated from them by British "safety zones." To the south were a string of Arab villages and in the east they were exposed to Arab fire from the Old City walls. The Arab forces made repeated attacks during the first months of 1948, but one after another they were repulsed. Between attacks, the residents were the target of Arab marksmen and sporadic bombardments (which they called "concerts") from Mount Zion. In addition, they suffered from a constant shortage of food and water. Nevertheless, it was from Mishkenot that soldiers of the Haganah set out to reinforce the units on Mount Zion and to attempt to relieve the beleagered Jewish quarter. Mount Zion remained in Jewish hands, but the Old City fell to the Arab Legion on May 29, 1948. With the departure of the British, communication between Mishkenot Sha'ananim, Yemin Moshe and the rest of Jerusalem was restored. At the conclusion of the War of Independence, Jerusalem was divided. The residents of the new state of Israel were cut off from the Old City and its holy places. Mishkenot Sha'ananim lay right on the border between Israel and Jordan. It was within easy rifle range of the Old City walls across a stretch of no-man's land and for some 19 years was at the mercy of Arab Legion sharpshooters. Many long-time residents left the dilapidated buildings. When hundreds of thousands of immigrants thronged to Israel in the 1950s, Mishkenot became the home of numerous large families, mainly from Turkey, as well as others who had been expelled by the Arabs from the Old City. The strong construction of the building, its thick walls and doors, gave the residents a feeling of security. But the constant sniping took its toll. Moreover, the small living area and the lack of facilities forced the residents to add improvised tin and aluminium shacks to the original building, further increasing its deterioration. In short, Mishkenot became a slum. Recognizing the uniqueness and the historical importance of Mishkenot Sha'ananim, Jerusalemites and friends of the city in Israel and abroad sought to restore the building and give it a useful purpose. In 1966, shortly after the election of Teddy Kollek as mayor of Jerusalem, the architectural team of Ehud Netzer and Tuvia Ketz was commissioned by the Jerusalem Foundation to begin work on giving the building a new lease of life. The original plan called for the conversion of the 106 year-old Mishkenot into an arts and crafts centre, with studios and workshops in which local artisans would ply their traditional crafts. At about the same time, neighbouring Yemin Moshe was declared a redevelopment area. Extensive plans were drawn up to rehabilitate the community and restore its original appearance. Then, in June 1967, Jerusalem was once again united as a result of the Six Day War. The guns and the snipers disappeared from the Old City walls. The no-man's land and the rubble between Mishkenot and the walls were turned into parks and gardens. With the establishment of an arts and crafts centre at the adjacent Khutzot Hayotzer ("Artisans' Lane"), the original proposal for the rehabilitation of Mishkenot became redundant and a new use for the buildings was sought. After much thought, it was decided by the Jerusalem Foundation to turn Mishkenot into a guest house for creative people. The site, opposite Mount Zion and the Old City, would provide a place of quiet seclusion where leading writers, artists and scholars from Israel and abroad could spend some time in the unique atmosphere of the city and participate in the cultural life of Israel's capital. Architects Gavriel Kertesz and Saadia Mandel joined Netzer in planning the new complex. Preserving the original façade and character of the building, they added modern conveniences by reducing the original 16 apartments to nine, building an addition on to the rear of each to accomodate a kitchen and bathrooms, and constructing a new building to house an entrance hall and lobby and a reception hall. On August 13, 1973, 118 years almost to the day after Sir Moses Montefiore had signed the deed for the land on which he was to build Mishkenot, the restored Mishkenot Sha'ananim guest house was dedicated. In the two decades since then, the roster of Mishkenot guests reads like a list of the world's most illustrious artists. Some of the guests conceive a work of art during their stay, others continue their work of research, while still others simply enjoy the peace and quiet offered by Mishkenot. In 1993, the opening of a restaurant provided a pleasant meeting place for Mishkenot's guests from Israel and abroad Over the past two decades, the guest house at Mishkenot Sha'ananim has developed both as a residence for outstanding creative people from around the world and as a centre of cultural activity. The snatches of music, sketches, poems and inscriptions in Mishkenot's guest book attest to its special atmosphere, perhaps most succinctly expressed by Umberto Eco, who wrote: Et in Arcadio Eco. As a cultural centre, Mishkenot has evolved in accordance with the nature of its foreign guests, who have the opportunity to meet, share their expertise and exchange views with their Israeli counterparts through lectures, workshops, informal encounters and small conferences, sponsored jointly by Mishkenot and other institutions. Thus, Mishkenot Sha'ananim has become a leading venue for international, interdisciplinary and inter- cultural activities. Much of the cultural work at Mishkenot has been literary in nature: since 1990, it has organized three week-long international poetry festivals, and has begun preparing the fourth, to take place in 1997. The success of these festivals, and the publications associated with each of them, have earned Mishkenot Sha'ananim an important place on the world's literary map. Lecture series and readings of poetry and prose are regular features of Mishkenot's literary programmes. Additional events include a residential workshop for young poets, a poetics forum and narrative colloquium, bilateral meetings between Israeli writers and writers from other countries, and programmes to encourage the translation of Hebrew literature. Saul Bellow, Philip Roth, Mordechai Richler and John Le Carré are just a few of the authors who have written at Mishkenot, and a number of Israeli writers, among them David Grossman and Meir Shalev, have begun or finished some of their works at Mishkenot. In addition to men and women of letters, artists and musicians also find their place at Mishkenot. Two painters' studios are available, and the grand piano in the library serves for both practice and concerts. Concerts, as well as art exhibitions, are often held in the adjacent music centre, Fisher Hall, or in neighbouring Yemin Moshe. Leading academic figures, too, have found Mishkenot a congenial place to pursue their studies and confer with their colleagues from Israel and abroad. The staff of Mishkenot maintains contact with leading scholars in a variety of fields, and initiate and facilitate conferences, symposia and lectures. Mishkenot Sha'ananim maintains a small library built partly of planned acquisitions but largely of gifts donated by its guests, its poetry collection being particularly well-endowed. Its photographic archive and files of correspondence with some of the leading figures of the past two decades often serve as a resource for journalists and scholars. Mishkenot Sha'ananim is a partner in the Words and Images Jerusalem Literature Project, a series of videotaped interviews with leading contemporary Jewish writers and intellectuals, among them Aharon Appelfeld, Gyorgy Konrad and Moacyr Scliar. Taking advantage of its secluded ambience, Mishkenot Sha'ananim has served, over the years, as a discreet meeting place where Israelis and Palestinians meet to discuss issues of public policy and the arts. Recently, Mishkenot Sha'ananim has expanded its involvement in regional issues, and together with the Van Leer Jerusalem Institute, has established the Israeli Forum for Mediterranean Culture. The aim of the Forum is to explore, together with experts from neighbouring countries, the concept of Mediterranean culture by comparing images, symbols and myths of local societies and by searching for what can be shared. Because of its growing importance as a cultural centre, Mishkenot Sha'ananim has drawn up plans which include programmes for its development as a cross-cultural centre as well as additional accommodations, offices and an auditorium. Political developments and the ongoing peace process in the Middle East make it seem likely that the "peaceful habitation" of Isaiah's prophecy will be realized in our lifetime. When it does, Mishkenot Sha'ananim will not only have contributed to its fulfillment, but will also be an integral part of it.